As a supplement to this book, the author has prepared a software package called SplinePak. 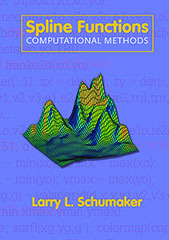 It contains 231 MATLAB p-files which encode the basic functions described in the book for carrying out a variety of essential computations with splines. It also contains 190 scripts which illustrate how to solve explicit problems involving interpolation, data fitting, and numerical solution of ODE's and PDE's. They can be used to run all of the examples in the book. The package is meant for educational purposes only, and is copyrighted. No commercial use of the code is permitted. The software is distributed "as is", which means that it is not guaranteed to be error free, and there is no support available for its use. The author does not assume any responsibility for any liabilities which may arise from use of the software.